Ben Lesser was born in Krakow Poland in 1928. He had 2 brothers and 2 sisters, his older sister Lola and he are the only remaining survivors out of his immediate family of seven. The rest of his immediate family as well as his extended family who numbered in the hundreds were all slaughtered by the Nazi’s in their willing collaborators. During those 5 years of living hell on earth, Ben was fortunate to survive several Ghetto’s and concentration camps, including the notorious Auschwitz, Buchenwald, he was liberated in Dachau. In 1947 Ben arrived to the United States and settled in Los Angeles where he met and then married his wife Jean in 1950. Ben & Jean have been blessed with 2 daughters, 4 grandchildren and one great-grandchild. In Los Angeles, Ben became a Realtor and had two successful Real Estate offices, Ben Lesser & Associates. He is past president of the Los Angeles Westside Beverly Hills Brokers Association. Since 1995, after retiring to Las Vegas, Ben has been devoting his time as a volunteer, speaking in schools and colleges on The Holocaust. Ben said that he has dedicated his present life to the pursuit of preserving the memory (ZACHOR) in order to prevent the world from contracting AMNESIA. Watch Ben in action. Listen to him speak at various schools throughout the nation. Hear the detailed accounts pre, during and after the war. Should you want to watch Ben Lesser’s historical Shoah, please click on the Survivor Testimonials. Navigate through the videos using the video log on the right side of the video player. A listing of important dates in Ben’s life, from birth to his life today in Las Vegas. Ben and family leave Krakow for Niepolomice. Leser family escapes to Bochnia in the middle of the night. Ben and entire family are forced to leave their homes and crowded into cattle cars for deportation to Auschwitz-Birkanau. Ben is sent to the Durnhau Labor Camp. Ben and Cousin Isaac survive Death March to Buchenwald, then Death Train to Dachau. They are liberated at Dachau. Isaac dies in Ben’s arms. Ben loses consciousness, waking up four months later in St. Ottilien Hospital in Germany. Joins young Zionist group moves to Feldafing, Germany. Ben moves into apartment in Munich, Germany with Lola, Mechel and Heshi. Ben arrives in the USA via the SS Ernie Pyle. Moves into Brooklyn, NY apartment with Lola, Mechel and Heshi; attends night school and peddles hosiery on Delancey Street. Ben takes a bus from New York to Los Angeles. Ben and Jean Singer marry in Los Angeles. Ben and Jean’s daughter, Sherry is born. Ben becomes a U.S. citizen. Ben and Jean’s daughter, Gail is born. Ben and Jean’s Granddaughter, Robyn is born. Ben Lesser & Associates established in Los Angeles. Ben and Jean’s, Granddaughter, Jenica is born. Ben and Jean’s Grandson, Adam is born. Ben and Jean’s Granddaugher, Cindy is born. Ben speaks about the Holocaust for the first time at Grandson Adam’s school. Ben and Jean retire and move to Las Vegas, Nevada. Ben and Jean visit Ben’s parents’ Memorial in the Bochnia, Poland Jewish Cemetery. Ben visit his parents’ Memorial in Bochnia, Poland with his family. Ben founds the ZACHOR Holocaust Remembrance Foundation; Ben speaks at the Tennessee State University Holocaust Education Conference Conference. Ben participates in the 2010 March of the Living at Auschwitz-Birkenau. Ben and 200 other participants visit his parents’ Memorial in Bochnia Jewish Cemetery. Ben and Jean celebrate their 60th wedding anniversary with their family and friends in Las Vegas. Lesser Family celebrates wedding of Granddaughter Robyn Kramer to Chad Weber. Ben’s book “Living a Life that Matters: from Nazi Nightmare to American Dream” is published. Ben’s Great-Grandchild, Joshua Naphtali (after his baby brother) is born. Ben’s Audio book of “Living a Life that Matters” released. 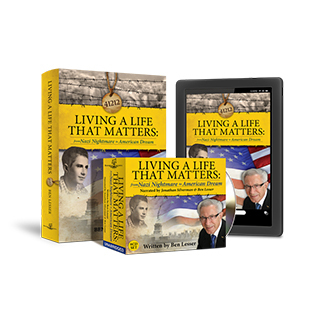 Living A Life That Matters is one of the motivational and inspirational books written by Holocaust survivors. In this engaging, inspiring, and educational Holocaust survivor memoir, Ben Lesser invites you to revisit a time in history when the world went mad. Learn how this ordinary, young Jewish teenager from Krakow, Poland, survived through extraordinary times living in ghettos, enduring four concentrations camps -- including Auschwitz, Buchenwald and Dachau -- two death marches, and two death trains. After liberation from Dachau, the Holocaust survivor slowly healed, eventually recovering physically from his near-death experience. At age 18 – penniless, uneducated, and unable to speak English – he made his way to the USA and succeeded in living the American Dream. Click on below link to buy biographies or books written by Holocaust survivors.